Bangkok is peppered with lots of good eats – it can be a high-end restaurant in a colonial bungalow, a simple restaurant in a street market – you seldom get something too off the mark. 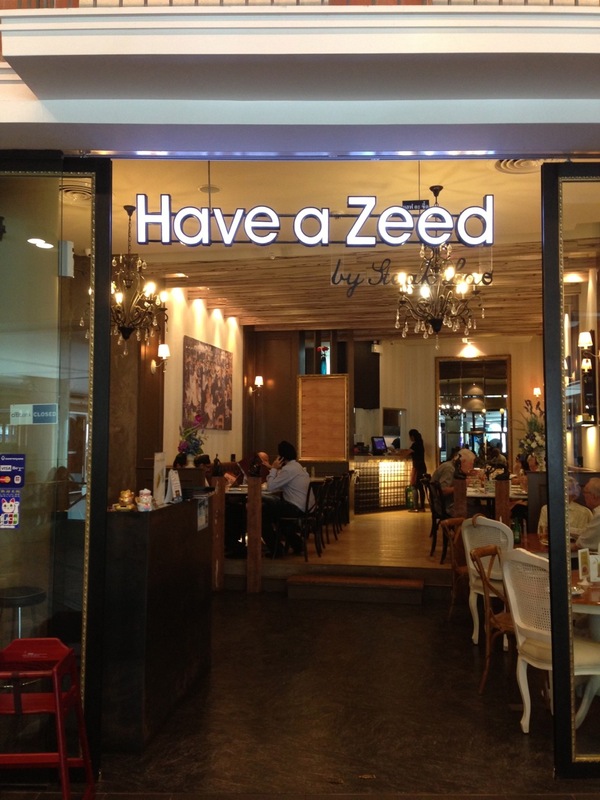 Have a Zeed (pronouced as “Seat”) is housed in a modern shopping mall just opened in 2012. Easily accessible from BTS, this would be a good place to have traditional common man Thai cuisine. I admired the details to the serving. 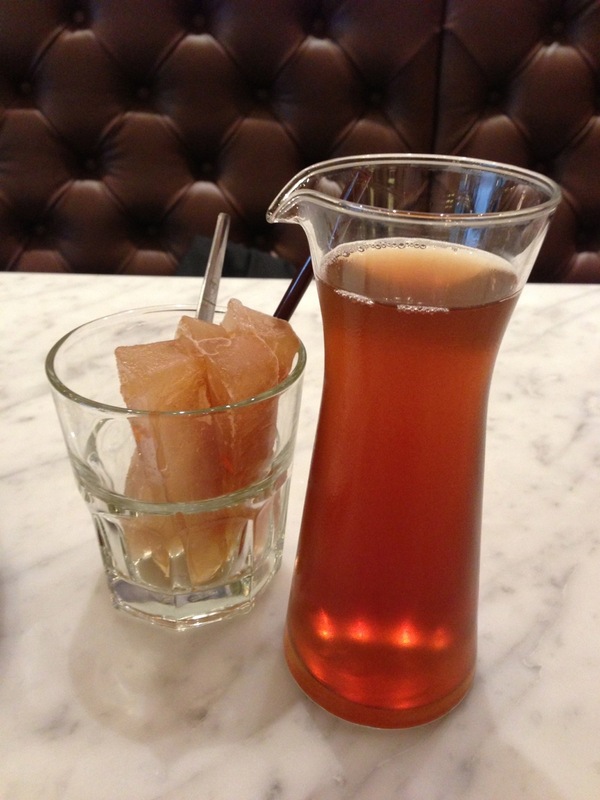 They even made ice cubes of the same drink that you ordered. The last time I was there, I ordered Coke and it came with ice cubes made from Coke. A very nice touch that show pride in the service. This is a dish not for the faint hearted (or the weak stomach). I had not had this dish since I got food poisoning in HK from this dish – it was winter, we went to a Thai stall in Kowloon, and the hygiene was not tip-top. I decided to give it another chance. 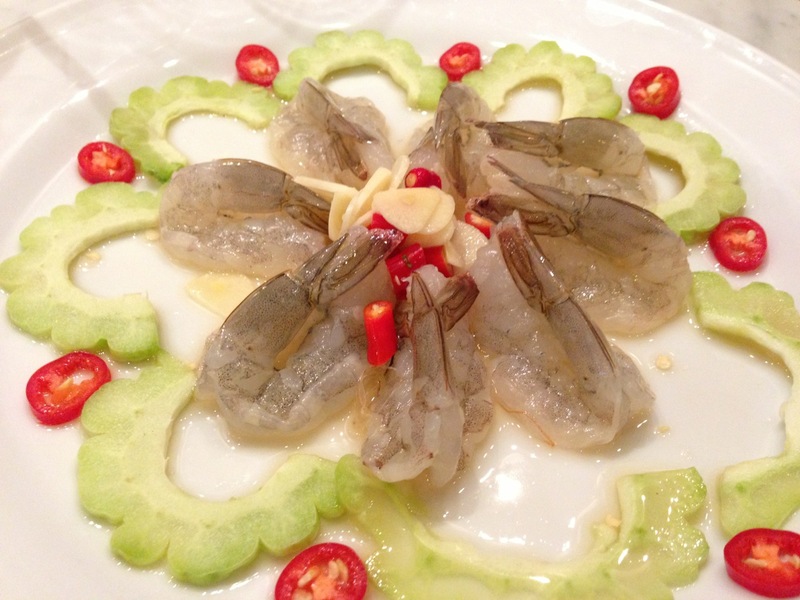 The simple dish was made up of fresh river prawn, gutted and marinated with lemongrass, fish sauce and lime juice, served with raw garlic. The chilli padi added a sting to the dish while the bitter gourd, well, did nothing. I survived this attempt (and many other attempts after in different parts of Bangkok). Kailan you get in Singapore either come from Thailand or China. 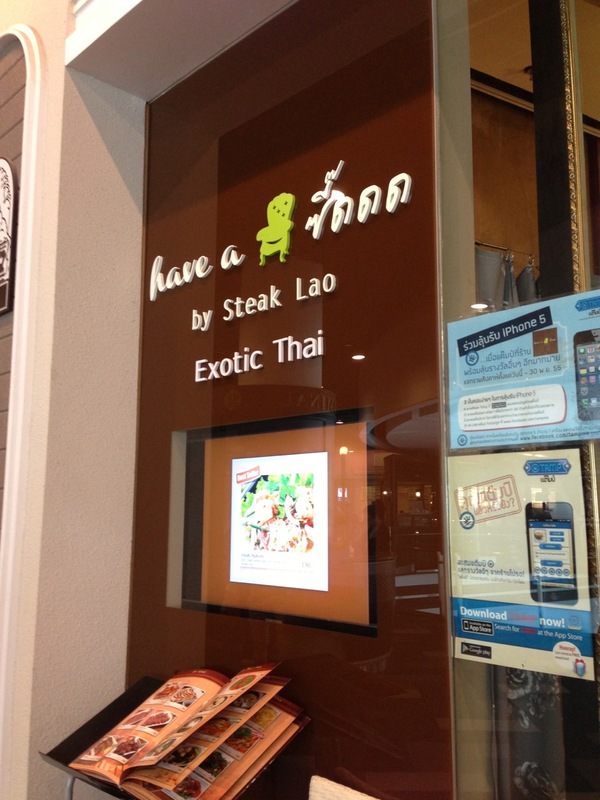 I prefer the Thai version. And the way they cooked it here is with lots of oyster sauce and fried garlic, and usually with crispy pork bits or salted fish. 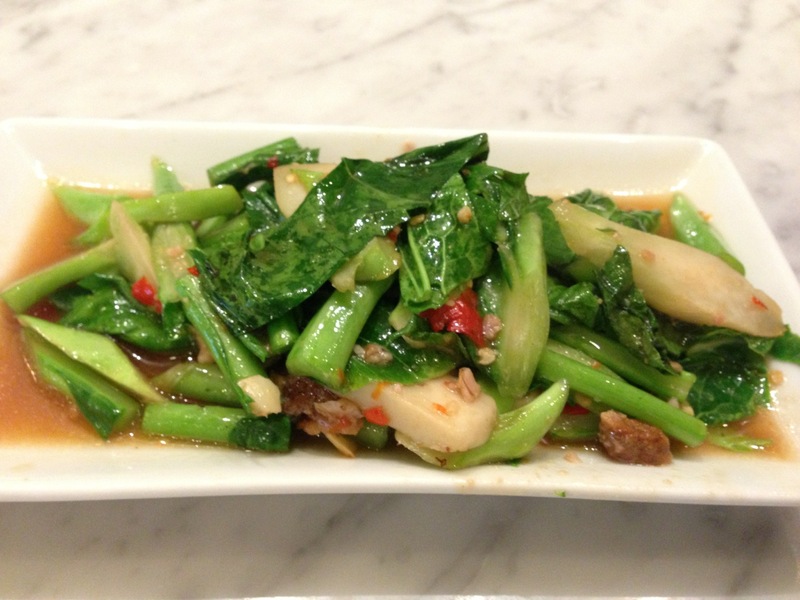 Grilled pork neck is another perennial favourite for Thai food lovers. Pork neck is the piece of meat just behind the ears and skull of the pig’s head. That precious stretch of meat is made up of mainly fats and gelatine and so is perfect for grilling. 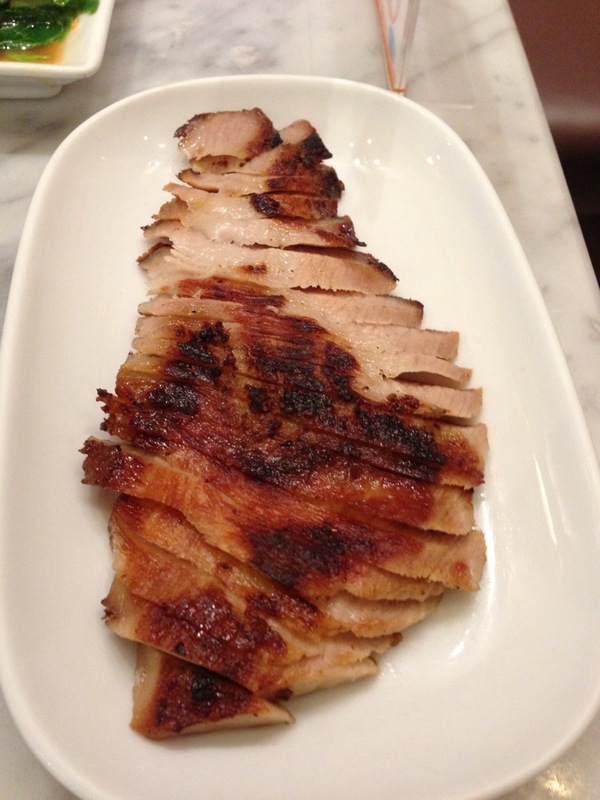 Spiced with Thai herbs, it is grilled and then sliced into thin pieces and usually served as an appetiser. 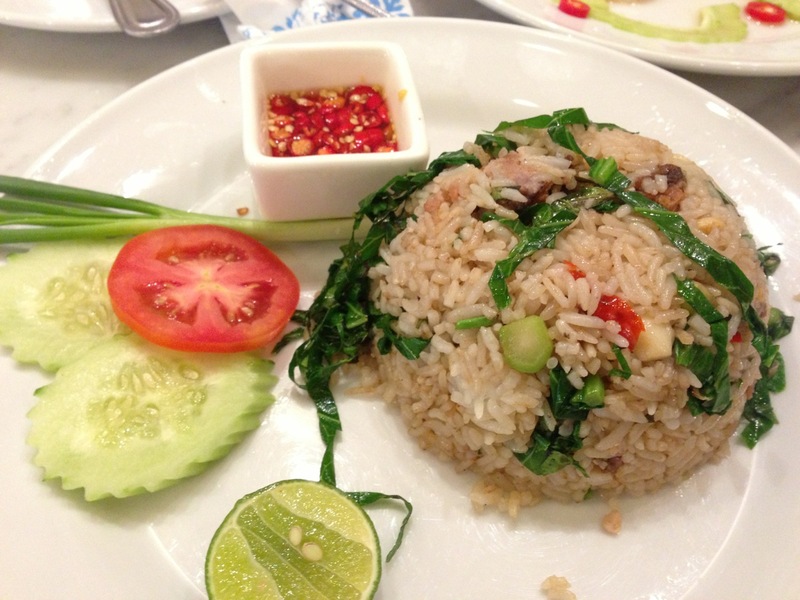 I love fried rice, and especially salted fish fried rice. Unlike the HK variety, the salted fish used is flaky and disintegrates when put into the mouth. And the flavour is more intense. Highly recommended if you are in that part of town. Service is great, price is reasonable at $10-15 per person, and the quality is excellent.